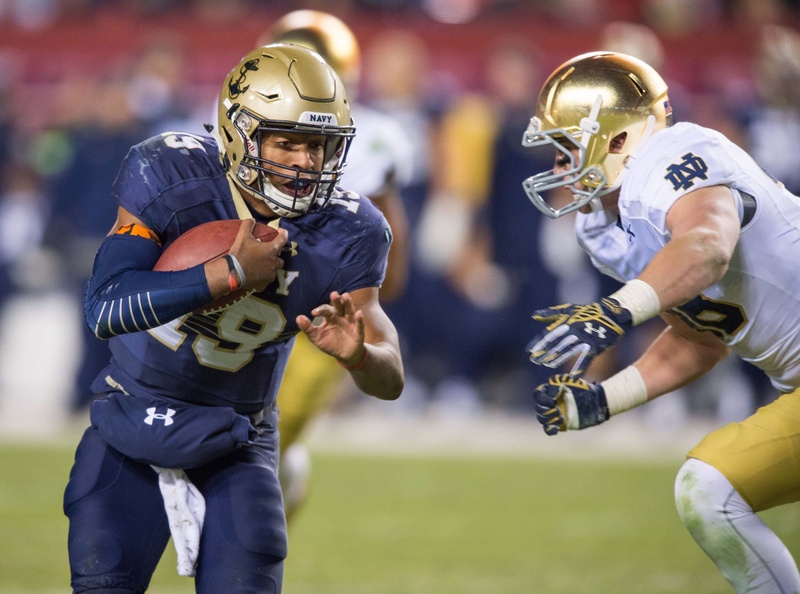 Two months before the 2015 college football season kicks off, the Navy Midshipmen announced plans for their 2016 meeting with the Notre Dame Fighting Irish: The game will head south to EverBank Field in Jacksonville, Florida. Navy athletics officials and representatives of the Jacksonville Sports Council revealed the site of the Nov. 5, 2016, contest at a Wednesday news conference at the stadium. The council is accepting ticket requests; prices start at $60. The announcement continues an every-other-year world tour for the Navy-Notre Dame matchup, with recent stops outside Washington, D.C. (2014), in Ireland (2012) and in East Rutherford, New Jersey (2010). Navy won the 2010 showdown 35-17 and hasn’t beaten Notre Dame since. EverBank Stadium hosts the NFL’s Jacksonville Jaguars, the TaxSlayer Bowl (formerly known as the Gator Bowl) and the annual Florida-Georgia regular-season matchup (unofficially known as The World’s Largest Outdoor Cocktail Party). It seats slightly more than 67,000 fans, but temporary seating can boost that number to 82,000 for events like the Florida-Georgia game, which will take place a week before the Navy-Notre Dame game next year, or the Super Bowl, which it hosted in 2005. The Irish host the Mids in South Bend, Indiana, on odd-numbered years — this year’s showdown will take place Oct. 10. Notre Dame is 75-12-1 all-time versus Navy in a rivalry that dates to 1927 and has visited Florida only once previously, with the Mids on the wrong end of a 45-14 rout in 2000 at Miami’s Orange Bowl. Big-time college sports’ last interaction with the Navy in Jacksonville didn’t go smoothly: A 2012 basketball game between Florida and Georgetown staged on the deck of the amphibious assault ship Bataan at Mayport was called off at halftime because of condensation on the court and reportedly lost more than $700,000 for the city. That event predates the city’s current sports council, a public-private venture formed in March 2014. Read more about the announcement from our good friends at First Coast News here.